I'm having a great week and I hope you guys are too. Today I am sharing a really fun tutorial! It takes a bit of time to get started but once you start the initial process it's so easy you can literally forget about it! If you want to mix science with diy for beautiful results, read more below! I fancied myself an amateur geologist and had/have a pretty nice rock collection to this day. The idea that I could make my own beautiful sediments appealed to me greatly. Unfortunately I don't remember too many of the experiments going well as I was an awfully impatient child, I am a saint today compared to younger RaChil. I would always mess with the crystals every hour or so to see if they'd grown yet, and then finally get bored and give up. It seemed like this project was going to go down a similar path, until I forgot about the crystals and left them alone long enough for them to grow! Step 1: Warm up 1-2 Cups of water and add them to your jar. 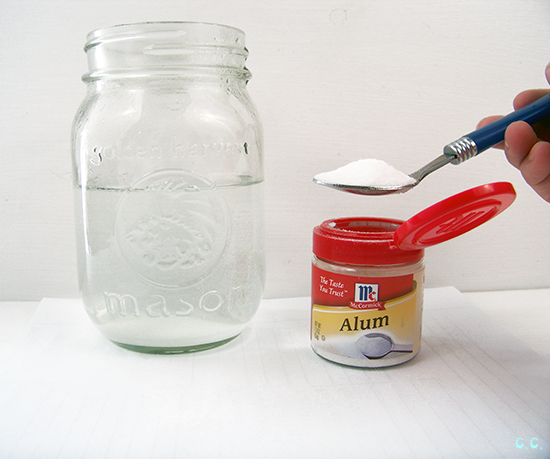 I added half of my container of alum. 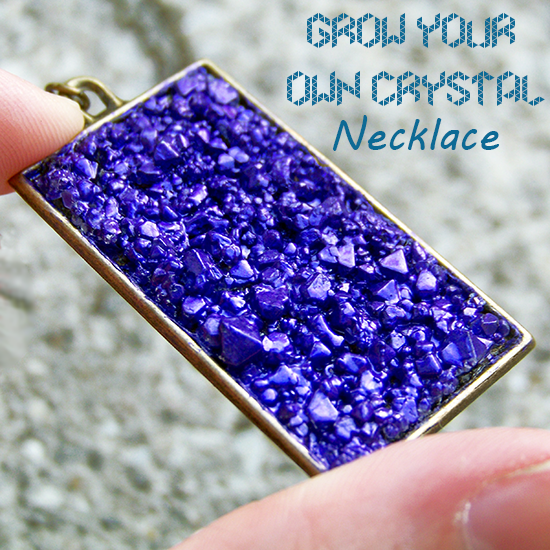 To make your crystals get larger in a shorter amount of time you can add more. I did two jars so I split one container between the two. Step 2: Leave your crystals alone for 10-15 days. Depending on the amount of alum you added the crystals could be done sooner or later(I left mine alone for about a month...when it wasn't done in 4 days I forgot...whoops!). Check on them every few days but try not to disturb the jar. Step 3: When your crystals have reached a size you are happy with, use a spoon to remove them from the bottom of the container. I left them to dry on a paper towel overnight, they are still fragile when freshly harvested. You can probably expect a mix of large-grouped together crystals and small-grouped or singular crystals. Step 4: I wanted to experiment with different coloring methods so I ended up using watercolors and nail polish. You could possibly try watered down acrylics or a tinted gesso as well. The left side is crystals I painted with the polish. The right side is watercolors. I liked both for different reasons; the nail polish gives it a metallic sheen and makes the crystals look more like gemstones, the watercolor really make them look like crystals. Its a light opaque color that looks more natural. 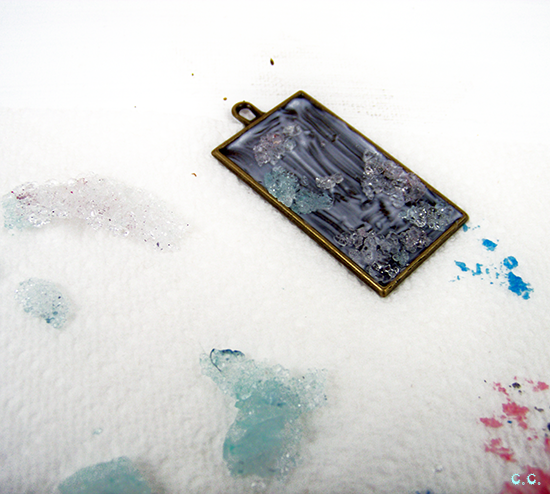 Step 5: Paint the base of your metal charm with a thick layer of mod podge. 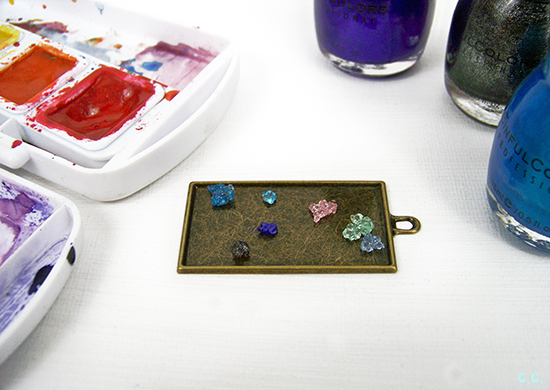 Step 6: Begin to fill in the charm in with crystals. I tried to start of with large pieces and fill in around them. Sometimes some of my bigger pieces needed to be broken down. I would gently separate the hexagonal crystals from each other. The crystals themselves are very hard to break on their own. 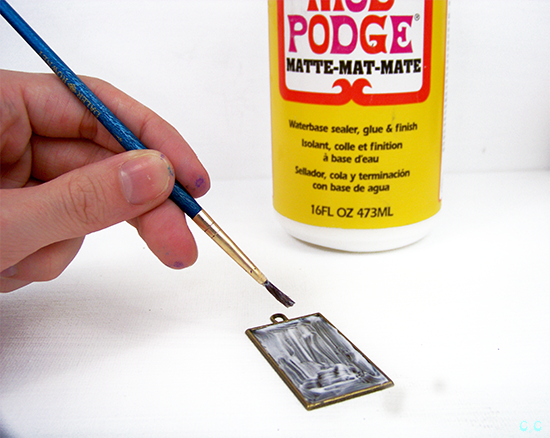 If your mod podge starts to dry, you can use the paintbrush to apply a tiny glob of 'podge to your crystal before you place it. Almost there but you can see where I have a few more places to fill in. Ready to move on to the next step! 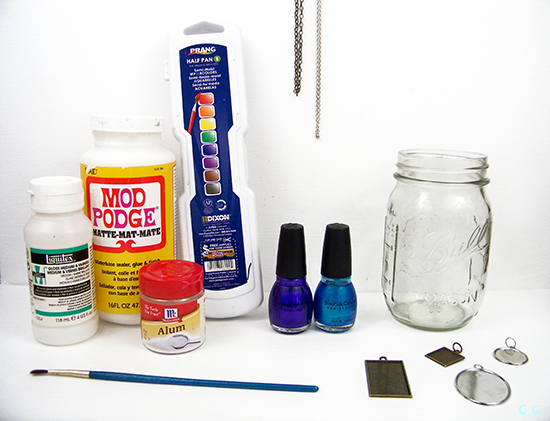 Don't use too much water, mod podge is water soluble so just get the most pigment with the least water. Less coats look more natural, more coats look richer. One coat gives sufficient coverage for me, I feel like more makes it a little thick. Nail Polishes could vary. Doesn't need sealed, or at least I have seen no reason to as of yet, will update if needed. When its all dry you're done! Attach an eye ring to the pendent and slide it on a chain! These babies sparkle in the sunlight! I think this one is my favorite, most probably due to purple being my favorite color. If I wasn't so biased I would say the blue one because it looks like Walter White's Sky Blue. I have enough crystals to make at least one or two more pendents, but my modge podge blank's pack also came with some ring settings...too bad I'm not a ring person, but is that maybe something you'd like to see? Let me know below! Do you find long projects to be rewarding enough to compensate for their time-drain? Normally I'm a like to work on shorter projects due to aforementioned impatientness, but I am really glad I forgot about those jars, and may even just leave the next set alone on purpose! P.S. I like to frequent these swingin' link parties! Holy crap this is the coolest thing ever. I'm sitting here wide-eyed at the results. Love it, RaChil! Oh gosh Mary! That's one of the best things I've ever heard about one of my projects :) Thanks so much! Glad I could inspire you! Stunning! I'm sitting here feeling so stupid! I didn't know you could do this. OMG!!! Pinning! Thank you so much Alli! Don't feel stupid, just feel enlightened! Regular salt and sugar make crystals too, but they're not as permanent, still fun to make if you're a kid though :) Thanks for the pin! :D Yay! Thanks for the vote ;) glad you liked it! Thanks for stopping by! What? This is the coolest thing ever! I'm totally geeking out over the awesomeness of these. I'm pretty impatient though, so I probably would never have the patience to wait a month before I could finish a project! :D Awesome! Thanks, I'm glad you like them! I totally understand that. I was never so happy that I forgot something! I sure could impress my grandsons with this! Pinning to my DIY board and making plans now. This is really cool! Thanks for sharing. How cool is this?! That's a cool necklace. Thank you Chene! I adore it, thanks for stopping by and commenting! Those turned out so pretty! Thank you Kristin! I am very happy with the results! :) Thanks for stopping by! Table salt and sugar will crystallize too! just not permanently! Let me know if you do, I'd love to see the results! Thanks for stopping by! XD Its really one of my favorite parts of this project, besides the fact that they are beautiful. When I forgot. progress was still made! That's a win-win situation. :) Let me see when they're done! This is amazing! I had no idea you could grow your own crystals. 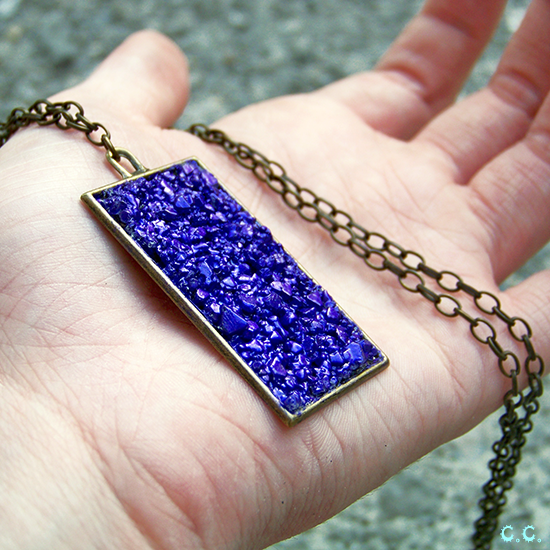 Love the geode look - I'll have to try this! Its a really fun hobby! Just set it and forget it. looks lovely- is it possible to add color while making the crystals itself? The results are stunning!! I definitely have to try this! Thank you! 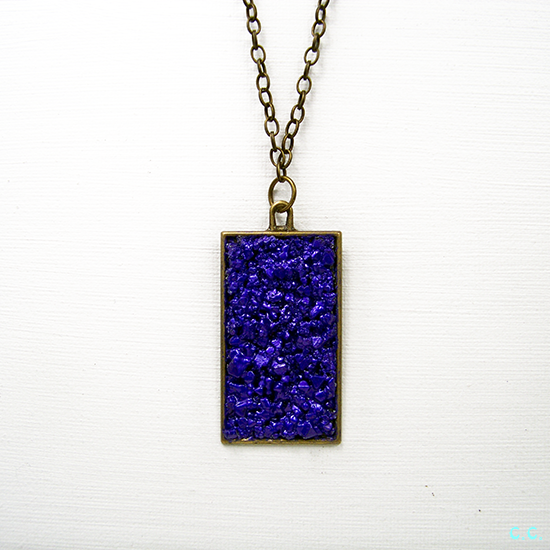 Let me know how your science/jewelry experiments go! Thanks Madaline! I wish they got done quicker too! I really loved this! So beautiful and the necklace would go well with any outfit! These are great! I'm going to show my daughter. I bet she'll want to make some. Thanks! I'm sure these would be a great summer project, you could whip up a batch or two a month! :) I'd love to see if she makes anything! I haven't made crystals since elementary school, but you bet I will be getting my supplies soon to get started on this! Thanks for the inspiration. Finally! Someone who has made them before! Weren't they awesome!!! You're welcome, I'd love to see anything you made! What would happen if you added food coloring to the water would it produce colored crystals? Previous expairiments say no, now if you grow the crystals on a surface (most people use egg shells) the surface will take on that color, and make the crystals appear to be colored. Thanks for the question! those are just awesomely awesome! Can you put the crystals into a form that does not have a backing, so you can see through the crystals from either side? I could not see why not, but you may wish to be careful with such a necklace. The crystals individually are strong but the bonds that connect large chunks can be broken with simple force. I'd love to see if you make that necklace! Thanks for this AMAZING tutorial!!! I can see myself using these pretty crystals on all sorts of projects!!! You are so welcome! I'm glad you feel inspired, I want to use these for plenty more projects myself! This is awesome! 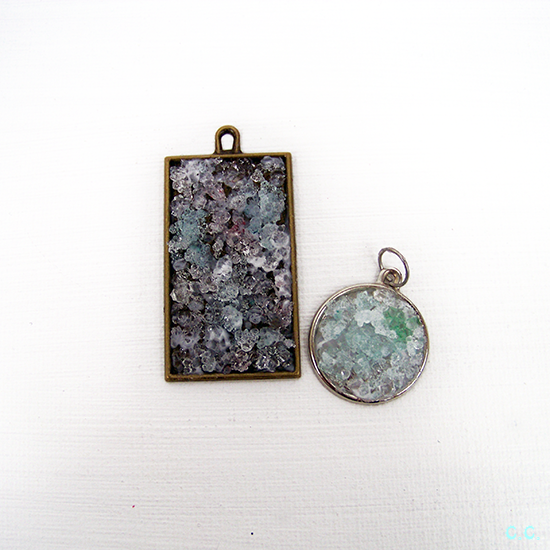 I've been experimenting with Alum Crystals and I love how you preserved them into a necklace! Lovely idea, Thanks! You probably need to seal it (with the nail polish or clear acrylic), because just as the crystals arose out of water, they could dissolve with humidity or accidental water, just like salt or sugar! Humm, maybe I'll try making a pendant by gluing rock salt from the health food store onto a pendant base. Sealing still seems optional at this point unless you color the crystals with watercolor, I did do some experimenting before I put up the tutorial, for example; I put the crystals back in water for a few hours, and they did not melt. Good luck with rock salt, that's a good idea! can you use food coloring in the water in the jar? Previous experiments say no, now if you grow the crystals on a surface (most people use egg shells) the surface will take on that color, and make the crystals appear to be colored. Thanks for the question! Oh wow, this is awesome! So clever! Thanks Lisa! Glad you enjoyed it! Have you tried with borax?? you would have crystals overnight. So awesome! Love this idea, and you totally pulled it off. Thanks so much for sharing this idea. Coolest thing I've seen on the web yet! I want to make some with my grand-daughter soon. You show a pic with two blue items - one dark midnight blue rectangle, the other a watery blue circle. I love the watery blue color. What did you use to create that color of blue? Was it a specific nail polish or did you use watercolors for that one? I'd like to replicate it as close as possible. LOVE this idea and cannot wait to give it a go! Seems you can't go wrong, even if you forget all about it! Great for grannies like me! My 6 year old and I just grew our crystals. They turned out great! We had one grow into a perfect diamond shape. Thanks so much for this tutorial! which uses the same ingredients to make larger single crystals. I'm going to try them both with my daughter this weekend. Thanks for the inspiration! So very cool. Must try this. 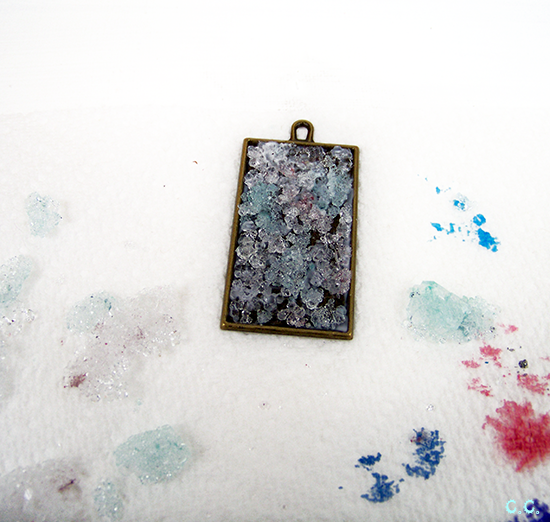 I wonder if the crystals would hold up using alcohol inks to color them. Alcohol ink is transparent (like the watercolor), but very intense, vivid color. So beautiful! Thanks for sharing! I will definitely be trying this! 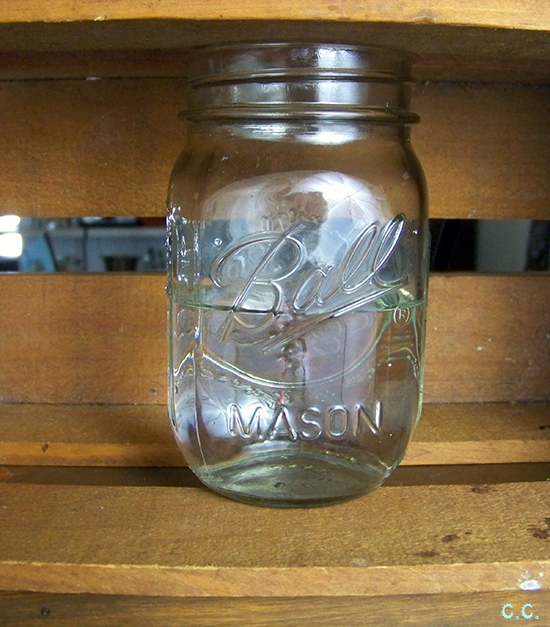 want to try with the water colors in the jar, I think it would great, if it works. Thanks for sharing! Love! It looks like you colored the crystals before you glued them and then painted them again, was that the case? 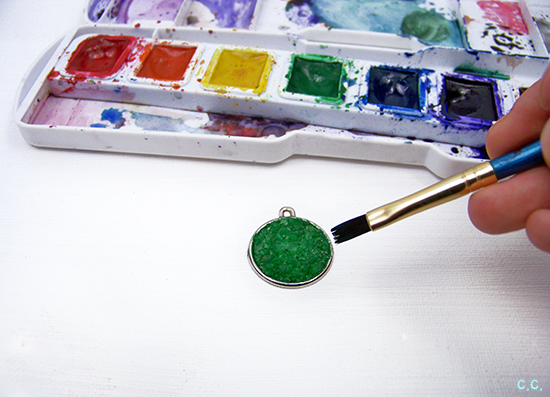 It also looks like the circle pendant was green before becoming blue, did you redo it? That's a really fun idea and could lead to awesome projects! Where did you get your metal charms from? This is so interesting! I'm completely geeking out over the possibilities - thank you! One question: do you cover the jar or leave it uncovered during the wait time while the crystals form? Thanks! What an awesome project! This looks so much fun and really want to try it. 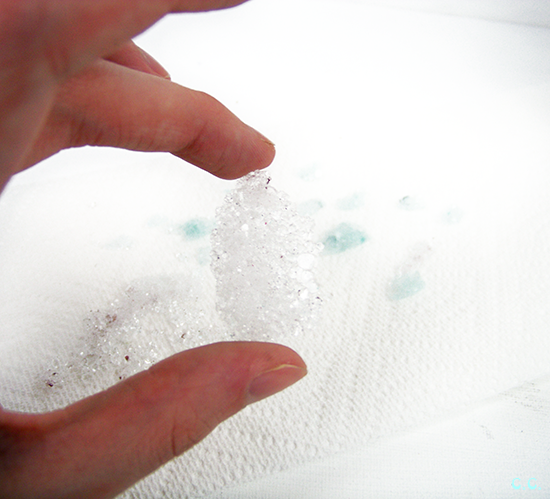 Totally forgot about doing this as a kid; we also grew salt & sugar crystals (rock candy). Thanks for the great tutorial. I did have a question though. Could this be done in batches coloring the water in the beginning using cake decorating gel colors (for a more intense color) or by adding the watercolor paint? Or would this interfere with the crystal formation? Thanks again for the fantastic tutorial; it is very detailed & that is much appreciated.